Newsflash: we are no longer amidst the LA Burger Heyday. It's not 2010 anymore. Gourmet burger spots aren't rising from the ashes on every Southland corner. This is totally fine. There were way too many options and many weren't worth the rent. The current spate of closures was inevitable. That said, it's still sad to think of some of the burger joints now in the In Memoriam portion of the program. For example, Pasadena's Haven Gastropub, purveyors of one of the most cravable burgs in town, recently shuttered. And don't even get me started about Beacon's beautiful, BEAUTIFUL burger. I still miss it like it were a deceased child. Even the almighty Umami has closed some locations. While I think the burger purge was necessary, it doesn't mean it's not kind of a huge bummer. The past few years Los Angelenos became accustomed to satiating burger whims with new, enthralling options. Bored of 25 Degrees? Go to Plan Check. Don't want The Counter? How about Stout? Yada yada yada. You can no longer really do that because most burger aficionados have encompassed the map. In fact, going into this past weekend, I couldn't think of a new burger I had had in 2014 that really gave me a burgerection (trademark pending...). I had a serious case of what the experts call The Burger Doldrums. Okay, no experts call it that. I just made it up, yet it perfectly describes my disposition. I desperately sought a burger I had never tried that would immediately make me believe in magic again. So, I did what every hungry man does in 2014: I Tweeted about my crisis. Said I needed to try a new burger. And a Twitter Friend (more valuable than "real friends" nowadays), Chris, recommended this place called The Black Sheep downtown. I had never even heard of it and the restaurant doesn't even have a website, but I was desperate, so I said (in my head), "You know what, Chris, you're a trusted Twitter Friend. 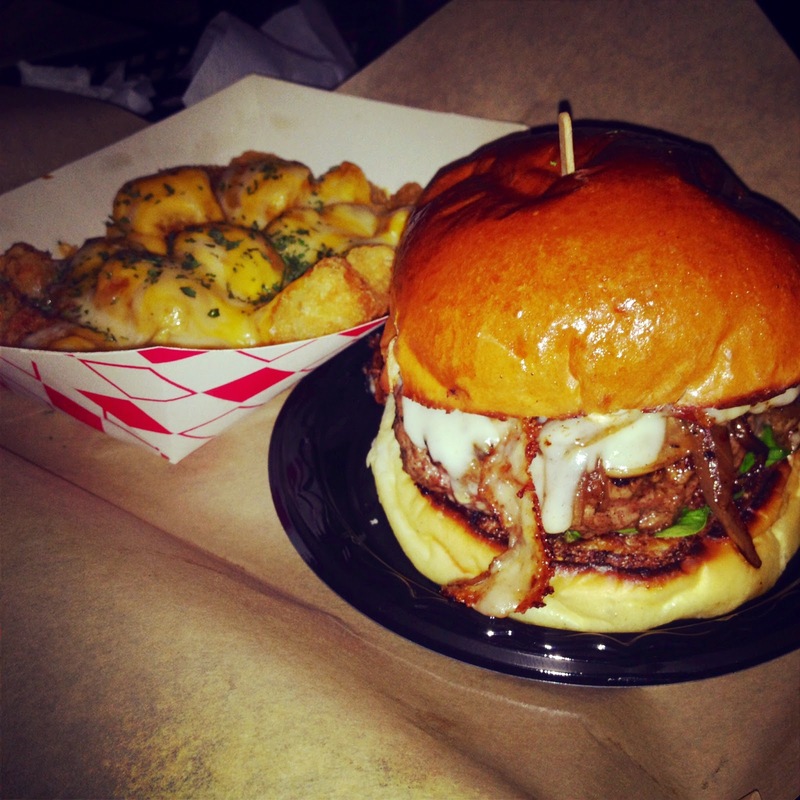 I'm going to go to this Black Sheep and get a burger and be happy again." There's a lot to like about The Black Sheep. First, it's affordable. No burger on the menu eclipses $9. There are almost no good gourmet burgers in LA at this pricepoint anymore. Secondly, it's order at the counter, which also adds to the affordability factor because you are not tied to a waiter tip, so your meal costs pretty much what you think it's going to cost when you see it on the menu. Going to places like Plan Check you're looking at about $30 for a burger/fries/beer/tip. Not at Black Sheep. Thirdly, the tiny, moody gastropub features a solid, intriguing draft beer selection. Every beer costs $6, which seems like a trick. It is not. The restaurant also features multiple tater tot varietals, which, while very much of the frozen superstore kind, will still make anyone joyous like only tots can. And, oh yeah, forgot: the burger is pretty tasty. A nice thick patty with superb searing, creating a crust of sorts, adding texture to every bite. I got the Steakhouse, which comes with a housemade peppery steak sauce. The favorite is the Black Sheep, which comes with a very complimentary gouda. My only suggestion is to either ask for no mayo, or light mayo because they Wendy's slather it on. One of the most intriguing factors of Black Sheep isn't the food at all though. It's the location. I never thought I'd say a DTLA burger spot destination would be ideal, but since moving to Culver City (thus, metro rail adjacent), I've become quite fond of exploring the city via train. And Black Sheep, a 15 minute walk from the 7th/Metro stop is in the heart of what I call Cool Downtown Bar Area. After our burger, we walked next door to the Varnish. Then across the street to Las Perlas. Then back across the street to The Association. Finally, a few blocks back toward the station and a last drink at Seven Grand. Overall, it was a fun, new, exciting burger expedition. The type I had been hoping for.